The Independent National Electoral Commission (INEC) said yesterday it will tomorrow conduct supplementary elections in 18 of the 36 states of the federation where results of certain elections were declared inconclusive. Gubernatorial elections in Sokoto, Plateau, Benue, Kano, Adamawa and Bauchi were declared inconclusive while that of Rivers State was suspended because of violence. Tomorrow, INEC is billed to complete the gubernatorial elections in Kano, Sokoto, Plateau, and Benue, while that of Bauchi and Adamawa will not take place because of court orders. The electoral empire had also yesterday fixed April 13 for the rerun elections in Rivers State. Daily Trust recalls that INEC had on February 23 held presidential and National Assembly elections in all the 36 states of the federation. While President Muhammadu Buhari of the All Progressives Congress (APC) was declared winner, the National Assembly elections in some states were declared inconclusive. And on March 9, gubernatorial elections were held in 29 states, state assembly elections in 36 states, and council polls in 6 Area Councils of the FCT. 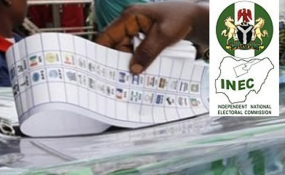 The gubernatorial elections in six states were declared inconclusive, that of Rivers suspended and dozens of state assembly elections also declared inconclusive, paving the way for INEC to conduct supplementary elections in 18 states tomorrow. Addressing a press conference yesterday in Abuja, the National Commissioner in Charge of Information and Voter Education, Festus Okoye, said details of the states and constituencies where elections would take place would be updated on the commission's website before the close of work last night. Speaking on what would happen in Bauchi which is a straight contest between Governor Mohammed Abubakar of the APC and Senator Bala Mohammed of the PDP, Okoye said, "The supplementary gubernatorial elections earlier scheduled to hold in Bauchi State is now a subject of litigation. An interlocutory injunction to suspend the process has been served on the commission by the Federal High Court, Abuja." He said the commission would comply with the policy to obey court orders in defence of rule of law, adding that they had taken steps to vacate the order and dismiss the action. "It should however be noted that the litigation and consequential order only affects the collation of results for the governorship election in Tafawa Balewa Local Government Area. Consequently, the supplementary election will proceed as scheduled on Saturday, 23rd of March 2019, in the other 15 local government areas of Bauchi State," he said. Our correspondents report that a Federal High Court in Abuja had fixed Monday, March 25 to rule on the application by INEC challenging its powers to stop the collation of results of the Bauchi governorship election. Justice Inyang Ekwo fixed the date yesterday after listening to arguments of lawyers in the matter. Counsel to INEC, Tanimu Inuwa (SAN) had argued that the court lacked the jurisdiction to dabble into a post-election matter by halting collation of results in Tafawa Balewa Local Government Area of the state. He contended that having rescinded its decision to declare the election inconclusive "based on facts that emerged later and made a return, any grievance arising therefrom now rest with the Election Petition Tribunal." However, counsel to the APC and Governor Abubakar, Ahmed Raji (SAN) contended that his clients could not go to the Election Petitions Tribunal without a result, adding that without a conclusive result and a declaration, the tribunal would have no jurisdiction to entertain the matter leaving them without a remedy. INEC's Head of Voter Education and Publicity in Bauchi, Ahmed Alhaji Waziri, said yesterday that 22,759 registered voters would participate in the scheduled supplementary elections. According to him, the scheduled re-run election would hold in 36 Polling Units in 29 Registration Areas (wards) across 15 of the 20 local government areas of the state. Shedding light on the gubernatorial election in Adamawa State, Okoye said INEC had complied with the order by the State High Court, which stopped it from proceeding with the supplementary elections following the application by the Movement for the Restoration and Defence of Democracy (MRDD), a registered political party, which did not take part in the main election because its logo was not featured on the ballot. He noted that the commission had taken steps to vacate the order, even as he explained that elections would hold in those constituencies where a candidate died before the polls. Justice Absul-azeez Waziri yesterday ruled that the order he granted earlier stopping all election processes in respect of the supplementary gubernatorial election remained in force. MRDD candidate, Rev. Eric Theman, had approached the court challenging the exclusion of his party from the polls. In the results so far declared by INEC, Ahmed Fintiri of the PDP polled 367,471 votes, while the incumbent governor, Jibrilla Bindow of the APC, scored 334,995 votes. Results as announced showed that Fintiri is leading with a margin 32,476. INEC also said it was ready to conduct the governorship re-run election across 28 affected local government areas of Kano state. The state INEC Resident Electoral Commissioner (REC), Prof. Riskuwa Arab-Shehu disclosed this while briefing newsmen on in Kano. According to him, there were 75 Registration Centres, 207 polling units and 279 voting points in the 28 LGAs, with a total number of 128,324 registered voters. Arab-Shehu explained that the governorship election was cancelled across 15 LGAs due to violence and 116 polling units were affected, adding that in these affected areas, the total number of voters stood at 73,173. "In 23 LGAs, the election was cancelled due to over voting and violence which disrupted the election process in those areas. "In these affected areas, we have a total number of 55,151 registered voters in 92 polling units across the affected Local Government Areas. "Earlier, we have 29 affected Local Government Areas, but we later realised that one of it, Bunkure where card reader was not used in one of the polling units, therefore it was declared as Invalid instead of cancelled", he said. On his part, the Commissioner of Police, Mohammed Wakili assured the residents of maximum security during the poll, urging them to cooperate with the security agencies to ensure that the process was not compromised. The contest in Kano is between Governor Abdullahi Ganduje of the APC and Engr. Abba Kabir Yusuf of the PDP. In Sokoto, all stakeholders have expressed preparedness for the supplementary governorship polls scheduled to take place in 135 polling units across 22 of the 23 local government areas of the state. There were 75,000 voters in the affected polling units while the margin between the two leading parties, PDP and APC 3,413. Governor Aminu Tambuwal is PDP's candidate while Ahmed Aliyu is the flag bearer of the APC. Supplementary elections would also hold for two House of Assembly seats one each in Goronyo and Kebbe state constituencies. The Resident Electoral Commissioner (REC) in the state, Abubakar Sadiq Musa, told Daily Trust that they were ready for the elections. He recalled that many of the areas where elections were cancelled was due to violence. "There was serious violence, fingers of some of our staff were cut off as a result of irresponsible attitudes of political thugs. The whole of Kebbe town was littered with ballot papers, card readers were destroyed," he said. It is going to be a straight struggle between Governor Samuel Ortom of the PDP and Emmanuel Jime of the APC. INEC's Resident Electoral Commissioner (REC) in the state, Dr. Nentawe Yilwatda, disclosed that all the sensitive and non-sensitive materials meant for the conduct of supplementary elections for governorship and state House of Assembly elections in the state were safe and ready for distribution. The REC further disclosed that 109,733 eligible voters would be participating in tomorrow's governorship supplementary elections in 22 out of 23 local government areas of the state. The Inspector General of Police (IGP) Mohammed Adamu has directed the Zonal Assistant Inspectors General of Police and their respective Commissioners of Police in states where supplementary elections are taking place to ensure that adequate mechanisms are in place towards ensuring a safe and secure environment for the conduct of the elections. A statement yesterday from Police Spokesman DCP Frank Mba, said the deployment was to strengthen the security arrangements around the polls. He said the IGP had deployed five DIGs, three AIGs, fifteen additional CPs to provide supervision, direction and support to the existing security structure already in place in those states. He said, "The DIGs are deployed as follows: DIG Usman Tilli Abubakar, Adamawa State, DIG Yakubu Jubrin, Benue State, DIG Frederick Taiwo Lakanu, Plateau State, DIG Anthony Ogbizi Michael, Kano State and DIG Godwin C. Nwobodo, Bauchi State." According to him, "Out of the fifteen additional CPs deployed, three each were deployed to Benue and Sokoto States, two each were deployed to Adamawa, Bauchi, Kano and Plateau States while Imo State got one." Mba said the IGP commended the officers for their sterling performance in previous elections, and charged them to remain patriotic, steadfast, professional, neutral and civil, but firm, in their conducts and actions during the make-up elections. He warned politicians not to undermine the electoral process by engaging in untoward practices such as snatching of ballot boxes, vote trading and violence of all kinds, stressing that violators will be made to face the full consequences of the law.